It is an ancient Lore. They are a people who live by different rules in a modern world. Reach out and touch the Dreaming of the Ancient Australian Aboriginal Lore, travel with the Rainbow Serpent and other Spirit Creatures of the Dreamtime. Learn how a world very different from your own survives amongst us. The loves, trials and passions of the Shaman who live sheltered by their Lore and yet who walk amongst us, ordering our lives in what is the oldest land on Earth. To Learn more about this ancient and remarkable culture, pop over to Australia an Ancient Land and discover more about what often is a hidden world. Shadow Dreaming is the first in ‘The Dreaming’ series. The story explores the contemporary lives of Australian Aboriginal Shaman who live within a family-based Community in the Northern Rivers region of New South Wales. Discover much about the lives, loves and culture of the characters as they seek for a balance of the world in which we all live. It is a blending of modern culture with the ancient spiritual beliefs and practices of our indigenous Australians and the men and women who are so much a part of The Dreaming. Shadow Dreaming, is the first in a series of four books which introduce the spiritual culture of the Aborigines. Readers will be introduced to a unique culture and be able to follow the lives of characters such as Ty, the sympathetic shaman of his Community, who falls in love with Aine, who is from the broader multicultural Australian community found in the cities, she becomes his spiritual partner and in turn is immersed in this unique Aboriginal culture. Join them as they fight to find their way in a world which can destroy their love, and their lives. Sky Song is the second book in ‘The Dreaming Series’ and takes you into the world the Australian Aboriginal Shaman and their ancient beliefs. Discover the world of the Spirit Men who govern our lives and learn of the Dreamtime and the Spirit creatures of another world within reach of our own. Come on a journey with Sean and Jenna as they fight to preserve their love for each other in a world that would deny them their future. Sean is the younger brother of Taipan who we meet in the first book, who lives within the shadow of his elder brother Taipan. Also a Shaman of his Community Sean must learn to deal with his love for Jenna who is discovering her own way in a world outside of the Community where they both grew up and yet still deal with the binds of her unique culture. A paranormal love story from a world that is ours, yet one that lives in the shelter of an ancient Lore. Each book in the Dreaming Series is a story in its own right. Step within reach of the Dreamtime and meet the mystical creatures of the Dreaming as they pass through our lives unrecognized. 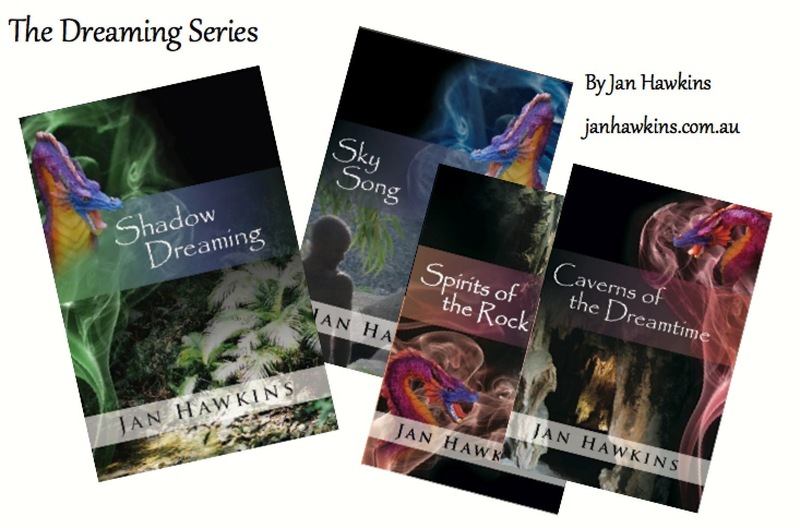 The third book in The Dreaming Series; Spirits of the Rock continues to explore the characters’ lives, their loves and the balance of the world in which we all live. It is a blending of modern culture with the ancient spiritual world of indigenous Australians. Learn of the Spirit Creatures of the Dreamtime and about the men and women who are so much part of The Dreaming. Journey with Andrew, as he tests the powers of the Australian Aboriginal Shaman, those gifted him in an ancient battle of tribal clans and the Spirit Men. Caught up in the draw between the Lore of the Rainbow Serpent into which he was raised and that of the Wandjina, a Lore belonging to the woman he loves. He must fight to find a balance in his life and the lives of his family before everything he holds dear is destroyed or taken from him. Step with Tom also as he struggles to come to terms with his own emerging strengths and meet Alex, a woman of the Bama who gets caught up in the lives of the two men as they walk through the shadows of the desert and savannah, drawn into its secret places. The story explores the contemporary lives of Australian Aboriginal Shaman who live within a family-based Community in the Northern Rivers region of New South Wales and ventures into the ancient rainforests of Far North Queensland and the red deserts of Central Australia. Explore the lives, loves and culture of the Shaman as they seek for a balance of the world in which we all live, a blending of modern culture with the ancient spiritual beliefs and practices of those who are so much a part of The Dreaming. The 4th and last book in The Dreaming Series, we journey with Tom as he matures into the Ancient Lore he was born to. Lost in the struggle between the Australian Aboriginal Lore and his fight to discover just who he is, Tom tries to make sense in the influences of the world around him and to find a place amongst his people. Reach into the Dreamtime and meet the ancient Kadimakara, creatures of a world of shadow. Learn about the balance of the worlds and the Spirit Men who influence and attempt to govern our very lives. Travel with Tom as he steps into the world of the Sorcerer’s and struggles to find his way back towards the world he knows. Faced with the decision about his future he has to decide which mould he would chose for himself and in which way he will model his life.